SF State theater group puts modern twist on biblical story in "The Last Days of Judas Iscariot"
Stephen Frothingham, middle, rehearses with other actors before the Judas Iscariot play, Jan. 28 at the Studio Theater in the SF State Creative Art Building. Photo by Mihail Matikov. It’s a story of biblical proportions. The trial of the ultimate betrayal. Judas Iscariot, the apostle of Jesus Christ, went down in history as the disciple who turned in his soon-to-be crucified leader to the authorities for thirty pieces of silver. The question of Judas’s motives for this took center stage Jan. 26 at SF State. 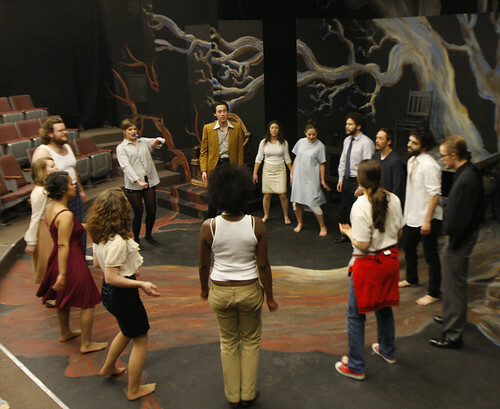 Paintings of dark, knotted trees engulfed SF State’s Studio Theater, an intimate venue and the setting for the play “The Last Days of Judas Iscariot,” a dark comedy chosen by SF State’s Players’ Club for their spring production. The Players’ Club is a student organization comprised of all theater majors that produces one full-length play of their own each year. It is directed, acted and designed entirely by SF State students. The play, which originally debuted at the Public Theater in New York in 2005, takes a closer look at the New Testament character of Judas and the story of his controversial actions which eventually led to his suicide by hanging. The play takes place in modern times. It’s a courtroom scene set in purgatory where one lawyer has chosen to defend Judas, who has been locked up in a catatonic state since he took his own life centuries ago. In the play both of these perspectives of Judas are depicted by the various witnesses called to the stand, including, Mother Teresa, Sigmund Freud and Jesus. The role of Judas has been one of the most challenging ever for Frothingham. He is on stage during the entirety of the two hour play going back and forth from acting out flashbacks used as evidence in the court or posed perfectly still in catatonic agony. For Frothingham the role has been both fulfilling and emotionally exhausting. “I get into my sad place for it. I’ll be crying, there’s snot coming out, tears and drool and then afterwards I have to find my happy place so I go and listen to some music. I just have to recenter myself because it’s unhealthy otherwise,” he said. SF State senior Casey Worthington has been acting since his days in high school, but this time around he is taking his passion for theater behind the scenes as director. He chose it because he was attracted to the deep subject matter that is brought up in the script. The remaining shows will be this Thursday through Saturday at 7 p.m. in the Studio Theater located in the Creative Arts building. For backstage interviews and photos, click here. SFSU students stretch out during a rehearsal before the Judas Iscariot play on premiered the night of Jan. 28 at the Studio Theater in the SF State Creative Art Building. Photo by Mihail Matikov. 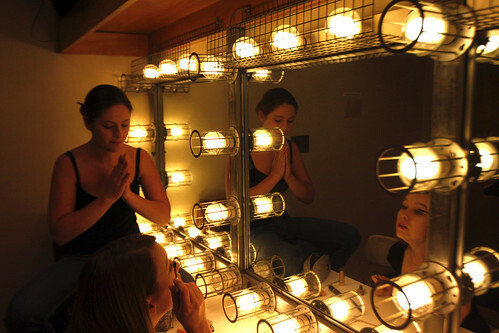 Emily Nyokka, left, and Jackie Szymborski prepare before the Judas Iscariot play, Jan. 28 at the SF State Creative Arts Building. Photo by Mihail Matikov.